This book is the first attempt to describe all the fifteen places with which the Buddha had direct association. Narration of each of these places accounts the mythology, legend, Jataka tales, cultural history, archaeology, field studies and general information. The books is illustrated with 55 photographs and 55 maps and figure, and also contain a description of the main link station like Varanasi, Allahabad and Gorakhpur. Nearby sites for excursion are also described in the context. The sequence of the fifteen Buddhist places follows the lifecycle and the journeys performed by the Buddha as narrated in the JatakaandTripitaka. Accordingly, the Buddha was born (563 BCE) in the garden of Lumbini (1), passed his first 29 years(563-533 BCE) in the royal palaces of Kapilavastu (2) and, after abandoning his home and family he ultimately reached Bodh Gaya (3), where he achieved enlightenment at the age of 35 (528 BCE). He did arduous austerities in Gaya (4), then he proceeded to give his first preaching at Sarnath (5) in 529 BCE. After this important event, known as "the turning of the whell of Dharma", he returned to Bodh Gaya. After visiting Rajagriha and Nalanda, he very frequently visited Shravasti (6), where he stayed during 24 rainy seasons, performing miracles and giving sermons. During the 6th (522 BCE) and 9th years (519 BCE) after enlightenment he stayed at Kaushambi (7). While returning to Bodh Gaya, to fulfil his Rajagriha (8) together with a thousand monks of his new order, and gave sermons there. On the request of his two chief disciples Sariputta and Moggalana, the Buddha visited Nalanda (9) several times. Thereafter, the Lord proceeded to Vaishali(10), the capital city of the Lichchhavis, where he gave his last detailed sermons and re-interpreted several of his teaching. Before his final march he stopped at the bank of the Ganga river in Patna (11), in a place called today as Gautama Ghat. While making his final march he stayed a couple nights at Kesariya away at the age of eighty (ca. 483 BCE). In the same year he descended from heaven at Sankisa (14) and gave his final preaching there. Mathura (15) was also visited by the Budha occasionally, and laer developed as the major center of the Buddhist art and sculpture in the Maurya period. The author, Rana P.B. Singh is Professor of Culture Geography at the Banaras Hindu University, Varanasi, India, and Founding President of the Society Heritage Planning and Environment Health, and also the society of Pilgrimge Studies. He has been involved in studying, performing and promoting pilgrimages and eco-tourism for the last two decades as a consultant, project director, collaborator, pilgrimage organizer and a wanderer. In the late 1970s my inner quest mobilised my sight and vision for understanding the genius loci of a place or landscape, ultimately trying to interpret and understand the meanings, messages and mi- lieus preserved there. Further along on that march, I don't know when I became a traveller, a wanderer, who always carried the familiarity and ordinary while moving in search of much more powerful set- tings, scenes, and sacredscapes. On this road while walking, people from different parts of the world joined and made our group a com- panion of seekers, a mosaic of culture, thought and vision. The Ameri- can philosopher David Appelbaum in his seminal book, Everyday Spirit (1993: p. xv), says that "The idea of a guidebook exposes a treachery in the language .... Such guidance exists only in a moment when the two worlds achieve contact: 'the physical world of existence and meta- physical world of meanings'" (italics added). Since the first stage of human evolution, the idea of the mystical power of place has been part of human consciousness. The identifica- tion of a place as sacred is never essentially one of individual recogni- tion; actually, the place is never' chosen' by humans, it is merely dis- covered by them. In some way or another the 'spirit of place' attracts and reveals itself to a human, and that is how he or she merely 'finds' it, though the process of discovery becomes easier when one follows the spiritual path. The quality of the sacred place depends upon the human context that has been shaped by it, with respect to memories, experiences, miracles and expectations. To every place, there is a key - direct communication with the inherent meanings and messages of the place. When the key is lost, the place is forgotten. Mythologies, folk tales, continuity of cultural traditions, the quest to understand what is beyond - all are the facets of crossings. To cross is to be transformed. On the ladder to cross from one side, the physical, to the other end, the metaphysical, the sacred places serve as rungs. The ladder provides the way of ascent through care and deeper quest. A spiritual walk is the ladder, sacred ways are the steps, and human understanding is the destination. Pilgrimage is a self re-discovery. The modem way of pilgrimage is an experiential bridge linking the modernism of the West and the mysticism of the East. Thinking together is a new vision. Going together is a new start. Walking together is a real march. Realising together is the final desti- nation - enlightenment. Without a pilot, one gets lost in madness, illness, or death. Without a way a pilgrim or traveller gets lost in the route. The way is a 'spirit' - spirit is an eternal sight for passing on the path in the right order. The process of understanding a place is a pilgrimage in search of interrelationship between the physical milieu and its metaphysical values. This book is an attempt to serve as a key, a way and a companion on this march towards crossing and soul healing. This is a humble attempt to narrate almost all the important sites and scenes of the Buddhist places where once the Buddha walked, with a view to expe- riencing the deeper meanings and messages. It is our wish that you and we will either meet in the Buddhist places, or, even better, that we will perform co-pilgrimage in and around these sites. Among the friends who accompanied me on several sacred jour- neys in and around the Buddhist places and those who supported me in various ways include the American art historian Fredrick Asher, the Buddhist co-pilgrims and co-authors Allan Badiner and Stephen Batchelor, the Dutch Indologist Hans Bakker, the President of the Naropa (Buddhist University) University at Boulder Thomas B. Coburn, the Indo-Italian activist Vrinda Dar, the Australian Buddhist monk Yen. S. Dhammika, the established British scholar Mark Dyczkowski, the Indian peregrinolo.ger D.P. Dubey, the Italian Indologist Gian G. Filippi, the Japanese Indologist Masaaki Fukunaga, the American scholar of mysticism Roxanne Gupta, the Vietnamese Buddhist Zen Master Thich Nhat Hanh, the Japanese Buddhist scholar Taigen Hashimoto, the British organiser of meditative and sacred jour- neys Roger Housden, the American scholar of Hinduism and Bud- dhism Sandy Huntington, the American art historian couple Susan & . John Huntington, the Belgian scholar of Hindu pilgrimages Bermijin Isabelle, the Norwegian Indologist Knut Axel Jacobsen, the Swede Indologist Marc Katz, the American art historian Robert Linrothe, the American scholars of Buddhism Pat Masters and Robert Pryor of Antioch College Program of Buddhist Studies, the British art histo- rian George Michell, the novelist and travelogue writer Pankaj Mishra, the Japanese Indologist Hisayoshi Miyamoto, the ex-director of the Tibetan Institute and prime minister of the exiled Government of Ti- bet Rev. Sam dong Rinpoche, the Japanese Hindi professor Teiji Sakata, the Danish Indologist Eric Sand, the Dutch scholar Irma Schotsman, the organiser of Buddhist pilgrimages Shantum Seth, the geographer of sacred places Ravi Shankar, the scholar of ancient Indian history Arvind Singh, the teacher of Buddhist literature Siddharth Singh, the American site producer and editor Pam Strayer, the historian of an- cient India Vibha Tripathi, the Austrian student of Vipassana Robert Wagner, and the Swiss tour organiser Hans Wettstein. The Indian professor of Buddhist philosophy Hari Shankar (Delhi University) needs special thanks as he has helped me in several ways to under- stand and to read sources and materials on the various facets of Bud- dhism. I am thankful to my friend Rakesh Singh of Harmony Book- shop (Assi Ghat, Varanasi), for his kindness in making accessible to me many of the relevant publications that helped the writing, and also encouraging me in several ways. For the last one decade my involvement as Co-ordinator/ Presi- dent to look after the Banaras segment of the NYSICCSI (New York State Independent Colleges Consortium for Study •in India, USA), Friends of the World Programme (Long Island University, USA), Dan- ish Association of Teachers of Religious Studies, Nordic Association of Teachers of Religious Studies, Karlstad University (Sweden) Pro- gramme of Indian Studies, Indo-Japanese Friendship Association, and Indo-Nordic Cultural Association, has helped several groups of schol- ars to get an insightful experience of the sacred journey to Buddhist places. Additionally, my association as President of the Society of Heritage Planning and Environmental Health and of the Society of Pilgrimage Studies has also been beneficial in understanding and ex- periencing the messages of pilgrimages. I express my special thanks to the American art historian Robert Linrothe (Skidmore College, NY), a friend and a fellow co-pilgrim, who so kindly edited some portions of the manuscript. In the whole journey his insights are always with us. Alvaro Enterria and Dilip [aiswal, the publishers and partners of Indica Books (Varanasi), have been a spirit behind the contract, progress and the final product. It is thankless to thank them because they are the companions along the sacred path and writing. However, above all I express my special grati- tude to Mr Alvaro, the man par excellence, who has been a rational and constructive critic and serious editor, together with raising so many pertinent questions which I enjoyed to answer and add. From the family side, how can I express my deep gratitude to my wife Manju 'Usha' who sacrificed so many good days in order to keep me free from the family duties and warned me to take care of health. She has always been a source of inspiration and a silent observer! My sons, Pravin and Prashant have assisted me in different ways, some- times in a very tense situation, to complete this work. Our daughters Pratibha and Prabha took care to keep up my spirits awakened and keep me on time. Ravi Shankar, a co-pilgrim, myoid student and now son-in-law, is a companion on the sacred march; to him I express my deep sense of appreciation for his rational criticism and inspiration. My brother-in-law Dr RP. Singh, a noted eye smgeon and director of the Buddha Eye Hospital has taken all the care for physical health and strain and stresses on my eyes during the course of writing and preparing the architectural designs; I'm very much thankful to him. More than anybody else, I humbly express my gratitude to the Buddhist Monk Yen. S. Dhamrnika (Buddha Dharnma Mandala Society, Balestier Road, Singapore), for being so kind on the path of Buddhist compassion to allow me to directly use several passages from his fascinating and first-hand experiences of the spirit of Buddhist landscape narrated in his famous book Middle Laud Middle Way (Buddhist Publication Society, Kandy, 2nd ed. 1999, © the author); the extensively used pages include: 10-19,33-34,37-43,69-71,88-91, 100-103,114,117,120-123,134-136,179,181,200-203, and 237-239. In a way, the present book is an offering to him. Remember, no one can write the last saga! This is a first and small attempt and certainly needs constructive criticism and suggestions for incorporation and change in the future. Background, the Buddha Purnima, the Four Nobel Truth, the Nobel Eightfold-path, the Ten rules, the three phases. Background, Sequence of the 15 Buddhist Places, Realisation, the Pilgrims -Ashoka, Fa-hsien, Hsuan-tsang, I-tsing, Marpa Chokyi-Lodro, Dharmasvamin, Edwin Arnold, Alexandeer Cunningham, Anagarika Dharmapala; The Buddha Statue. Approach and historical background, Lumbini Development Trust, Ashokan Pillar, Sanctum Sanctorum, Mayadevi Temple, Puskarini, New Excavations, Nepalese Buddhist temple, Tibetan Monastery. Approach & background, Life of the Buddha, Monasteries, Stupa, Archaeological site, Visit of Fa-hsien and Hsuan-tsang, Stone Caskets, Palace of king Suddhodana, Other ruins. The Mythology, Association with ancestors-rites, Phalgu River, Akshayavata, Pretashila, Vishnupad, Gayashisha (Brahmayoni). Lomasa Rishi and Sudama rock cut caves, Stupas, Shiva temple, Sidhesvara Peak, Nagarjuna Hill. The Buddha and Kashi, Approach & historical background, Cahukhandi Stupa, Tibetan temple , Thai temple, the Archaeological Museum; Archaeological and excavation area: Dharmarajika Stupa, Main shrine, Ashokan lion-pillar, Mulagandhakuti Vihar, Dhamekha Stupa, Dharmacakra Jina Vihar; Burmese monastery, Vajra Vidya Samsthan, Jain Temple, Mahabodhi Temple, Deer Park, Korean Temple, Chinese Temple, Sranga Nath Temple, Japanese Temple, Tibetan Buddhist Vihar, Singhapuri Tirtha, Tibetan Institute. General background, Accommodation: Hotels, Guesthouses, Pilgrims' rest house, Restaurants, Travel Agencies, Bookshops, Reference Books. 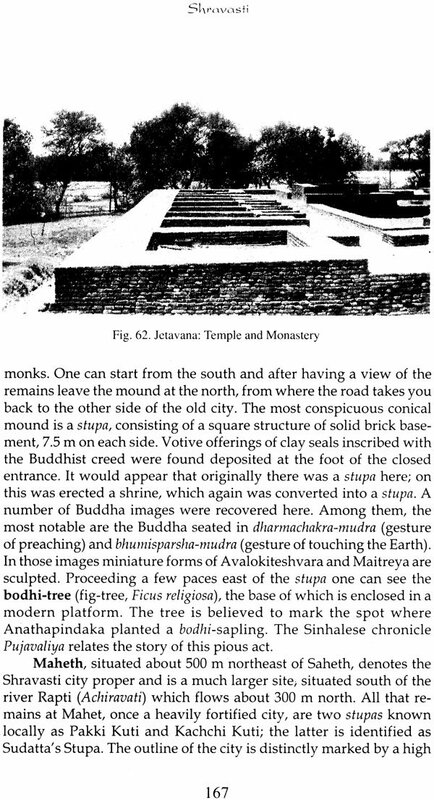 Approach and background, Great Miracle, Cultural history, Buddhist Gatha, Jetavana Vihara, Remnants, Saheth -Bodhi tree, Maheth -Sobhanatha Temple, Pakki Kuti, Nava Jetavana Mahavihara, Temples, Monasteries, the Bodhi Trees, Kosambakuti, Gandhakuti, Stupas, Pond. Accomodation. Approach & background, Cultural history, Six Teaching, Kosam-Inam and Kosam-Khiraj, Fortress, Ashokan Pillar, Ghositarama Monastery, Prabhosa Hill, Archaeological evidences. Approach & historical background, Venuvana, Karanda Tank, Ajatashatru Fort, Satadhara, Lakshmi Narayana, Mahadeva, Jarasandha-ki-bithak, Pippala Cave, Adinath Temple, Saptapurni Cave, Jain Temples, North Gate, Maniyar Math, Sonbhandar, Bimbasara Jail, Jivakamarvana Monastery, Gridhrakuta Hill, Vishva Shanti Stupa; Rajgir Festival. Apporach & historical background, Ruins of Nalanda university and library, Chaityas, Monasteries: 1 to 11, Ancient temples, Archareological Museum, Sarai Mound, International Centre for Buddhist Studies, Thai Temple, Surya Temple. 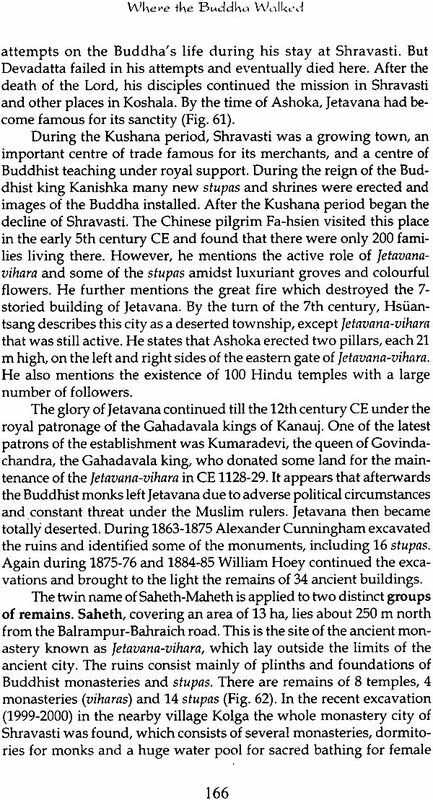 The Jain holy places and temples, and Buddhist remains. Approach & historical background, 2nd Buddhist Council, Cornation Tank, Vishva Shanti Stupa, Raja Vishala ka Garh, Ashokan Pillar, Miranshak-ka-dargah ; Facilities. Historical background; Places of interest: Buddha (Gautam) Ghat, Patna's Buildings, Golghar, Har Mandir, Qila House, Gulzarbagh, Ruins of Kumrahar, Patna Museum; Hotels. Location and approach, Ruins at Deura, Night stay of the Buddha and his announcement, Rana Ben and his Fort, The Kalamasutta, the Main Buddhist stupa, comparable to Borobudur; theJataka Tales. Approach and historical background, Wheel of Dhamma, Main Stupa, Nirvana statue of the Buddha, Matha-kuar shrine, Cremation Stupa, Makutabandhana Chaitya, Ramabhar Stupa, Kunwarkakot Matha: Monasteries of Southeast Asia: Myanmar, China, Japan, Tibet. Approach & historical background, Great Miracles, Sankisa Ladder Bisahari Devi, Stupa, Mound, Elephant capital, Chaukhandi, Railing Pillar, Nagasara. Approach, Fa-hsien's visit, Hsuan-tsang's visit, Mathura Buddha, Excavation, the Government Muserum; Hotels.